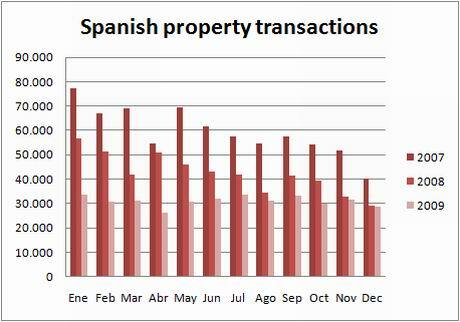 They thought 2008 was bad, but last year was a veritable annus horribilis for the Spanish property market. Can 2010 be any worse? 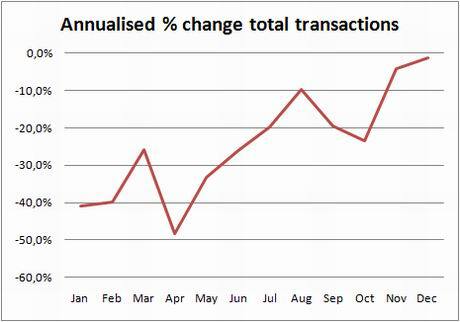 Year on Year the market shrank by 27% in volume terms to 372,000 transactions in 2009 (not including social housing), according to end-of-year figures from the National Institute of Statistics (INE). Compared to 2007, when the market was starting to come off the boil, transactions were down 48% from a whopping 715,000 sales. But on the face of it, it looks like the market is starting to bump along a floor of around 30,000 transactions per month. If this turns out to be the case, then 2010 might look okay in annualised terms, but only in comparison to the worst year ever. Looking at the monthly figures for December, there were 28,669 home sales in December, the second lowest level of monthly sales on record. But compared to December last year, sales were down just 1%. That’s because, by December last year, the market was already deep in crisis. From now on, annualised comparisons won’t look so bad, and won’t give any indication how far the market has fallen. The following graph shows how the annualised trend improves with every passing month, whilst in reality the market is at all time lows. 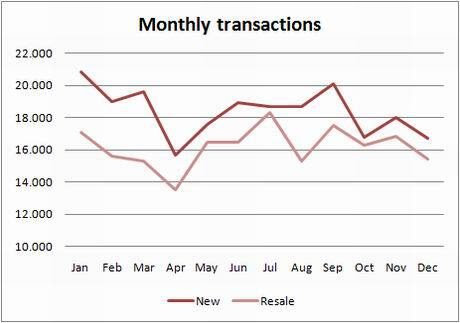 When the market hit the skids, resale transactions collapsed much quicker than new builds, which outnumbered resales throughout 2009. In normal market conditions, it’s the other way around. As 2009 went by the two started to converge, and in 2010 resales may once again overtake new builds, though it does depends on whether banks are prepared to lend to resale buyers. Expect annualised comparisons to stabilise or improve slightly as the market bottoms out at around 30,000 transactions per month, though there could also be another lurch down if new build sales double dip.